Use the filters to narrow down by size. 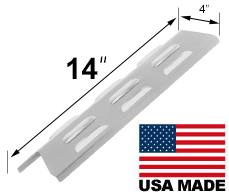 Please remember, the best way to measure the heat plates for your gas grill is to remove the original heat plates and measure them outside of your grill. Nexgrill Heat Plate, Porcelain Coated Steel | 12-1/8" x 6-3/8"
Heat Shield, Stainless Steel - Uniflame - 12 7/8"
NXR Heat Plate, Stainless Steel | 13-1/4" x 3-1/2"